After researching dozens and dozens of snowboards, we bought the 12 most promising snowboards on the market in 2019 and tested them head-to-head in our quest to find the best female-friendly board of them all. We rode these boards in tons of different conditions, everything from perfect powder to icy crud, rating their performance side-by-side. We rated and scored how each board carved and floated in powder, how stable each one is at high speeds, and their playfulness, as well as how well each one popped and jumped. Check out our complete review below to see which snowboard reigns supreme, which is the best bang for the buck, and which one is or absolute favorite for big mountain. If you want the best of the best all-mountain board, it’s hard to find a better option than the Yes. Hel Yes. Earning the Editors' Choice Award, the Ladies Choice by Gnu did exceptionally well in all our tests. If you want a big mountain board without a ton of pop, consider the Aura. If you are a hard-charging aggressive rider and want a board to match, the Story Board is for you. The Klassy is a fantastic all-mountain snowboard that won’t break your budget. Looking for an all-mountain charger that will rise to the challenge in any conditions? We loved this board for its ability to step up in all types of snow, from the hardest icy chop to the softest champagne pow. The Yes Hel Yes has the perfect combination of all-mountain versatility, solid handling, and playful fun that even the most aggressive riders will appreciate. It offers some of the best edge hold out of any board we tested and is incredibly stable at high speeds, but offers the perfect amount of surfy float in deep powder. We had a difficult time finding faults with the Hel Yes. However, this is a board that might be a bit challenging for beginners, and probably wouldn't be ideal for riders who plan to spend most of their time exclusively in the park. We would recommend this board for all-mountain hard chargers who demand responsiveness and control without sacrificing playfulness and fun. Read review: Yes. Hel Yes. Tying with the Yes. Hel Yes for the top score overall, the Gnu Ladies Choice also earned an Editors' Choice Award for its superb performance. This board is an extremely versatile all-mountain board that cuts through pretty much any type of snow, instills confidence at high speeds, and is probably the best freestyle board of the bunch. After all, Jamie Anderson did win gold in Pyeongchang riding this model, which also happens to be her signature edition. This board does have a ton of float in powder, but it can't quite compete with some other boards that have a ton of powder-specific design features, like a directional profile and a huge nose. The Gnu Ladies Choice is a true, twin tip freestyle board that kills it on pretty much the entire mountain. We would highly recommend this board to almost anyone, hands-down. Shopping for a snowboard without a ton of extra cash to spend? Then look no further than the Gnu Klassy. This board costs quite a bit less than the top products that we have tested but holds its own with them when it comes to performance. It's a great all-mountain board that particularly excels when going fast. It offers tons of control edge to edge and is absolutely fantastic at carving. It's got a medium flex and does quite well in all but the deepest powder stashes. However, the directional profile means it is a bit funky to ride switch and there are far better park boards out there. It can also be a bit daunting for novice riders, as this board really wants to go fast on groomers and can be a bit intimidating if you aren't ready for higher speeds. Regardless, we would highly recommend the Klassy if you are trying to save some cash and don't plan on spending all your time in the park. If you are planning on riding in the deepest of deep snow, who better to bring along than a true denizen of the depths? Earning the Top Pick for Powder award, the T. Rice Orca by Lib Tech is our absolute favorite when it comes to riding the fluffy stuff. This board is totally unmatched when it comes to floating in deep snow, saving your legs and letting you maximize your powder day. It is also one of the more stable boards — even at high speeds — and has a solid edge. However, the Orca isn't necessarily the best for intermediate riders. It wants to go fast and be ridden aggressively and a more novice rider is going to have a hard time checking that impulse. It also isn't as playful and lacks the pop of some of the other boards we have tested and can be a little squirrely on uneven terrain. It has enough edge hold that you can still have fun with on choppy snow, but you can tell that the Orca isn't crazy about icy bumps. Despite these flaws, it's still our go-to board for the days with the deepest dumps, hands-down. The Story Board is a beast of a snowboard that blasts through any type of snow without breaking a stride. It's designed for women that have a hard-charging aggressive riding style, not for anyone who wants a softer, mellower ride. This board absolutely wants to fly down groomers, obliterating any chop or crud in its way. It's exceptionally stable at high speeds and is great edge to edge. Its got decent float but it is a bit on the heavy side for powder, making it more of a big mountain board than a dedicated powder board. However, this board is on the stiffer side and we wouldn't really recommend it if you spend a large portion of your time in the park or riding rails. It can also be a bit daunting for beginners, as the Story Board wants to go fast, so you best be prepared to oblige. Some of the best boards on the market in 2019, ready to test head-to-head! Our lead snowboard tester, Marissa Fox, has over 25 years of snowboarding experience and has ridden mountains around the world, from Heli-boarding in Canada to shredding Swiss Alps. She is a former professional athlete in big air competitions. We've also consulted with other expert riders on our selection and testing procedures, as well as getting their opinions on the different boards and how they handled. We've spent close to 100 hours testing and comparing the boards in this review, riding them in every possible snow condition. We performed a series of maneuvers and tricks with each board in each condition and scored their performance side-by-side. 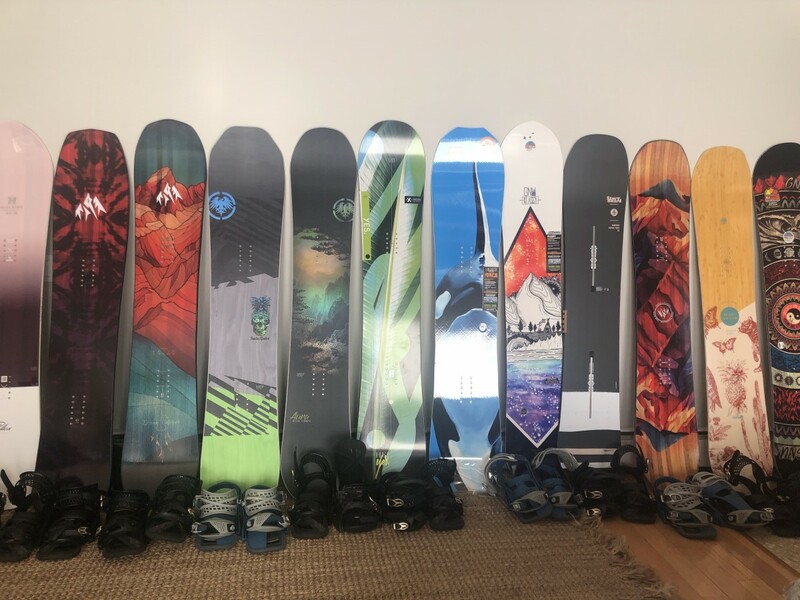 Once we had settled on some potential award winners, we spent some extra time taking those boards out and really comparing them head-to-head to truly find out which board is the true all-mountain quiver killer. To find out the best women's-specific snowboard of them all, we began by undertaking an extensive research project to identify all the most promising boards, then bought them all to test side-by-side. We currently have 12 of the best boards around in our review and rode them in all sorts of conditions, rating and scoring them on everything from stability at speed to playfulness and pop. Our testing process is divided into five weighted rating metrics, with a full discussion of our results below. Unfortunately, being the best comes at a price — most of the snowboards are definitely on the pricey side. If you are shopping on a tighter budget, then we would recommend the GNU Klassy. This board isn't the best we have seen, but it holds its own with other boards that cost hundreds of dollars more, earning it the Best Buy Award. It's tons of fun to ride, super stable at speed, and does a decently good job of floating in deep snow. Our other award winners all cost about the same, but we would recommend against the Orca if you are shopping on a budget. It's one of the more specialized boards we have tested — and also one of the more expensive — and we wouldn't really want to ride it in all snow conditions, so a more versatile all-around board gives you a bit more bang for the buck. The Swoon Rocker is soft and playful, but we weren't enamored with its edge hold at high speeds. By far the most important of our testing metrics, our series of edge hold tests account for 40% of the total score for each board. Having a board that grabs and locks into harder snow and ice is critically important for anyone who isn't exclusively riding freestyle. Freestyle riders will actually detune their edges so they don't grab when doing a trick or riding a rail or other feature, but they are definitely the exception when it comes to edge hold. Anyone else on the mountain is going to want a solid edge hold, regardless if you are zipping through the trees or carving up groomers. Aggressive edge hold lets you ride hard and fast on all sorts of terrain. We took each board out in various snow conditions and rated how well they grabbed with both the toeside and heelside edge, paying particular attention to how grabby each board is with hardpack snow, crud, and ice. This was one of the first tests that we did, relying on the factory tuning of each board out of the box. Most newer boards have some sort of serrated edge, marketed under various names — magne-traction, grip-tech, etc. — and we found this made a huge difference when it came to edge hold, with all the top scoring boards having some sort of scalloped edge. Tying for the top spot of the group, four boards earned exceptional scores for their superior edge hold: the Yes. Hel Yes, the Gnu Ladies Choice, the Burton Family Tree Story Board, and the Never Summer Aura. All five of these boards grabbed the firmest of snow and ice with ease, and we never once slipped or got washed out in the course of our testing. The Hel Yes is one of our favorite boards for superior edge hold. Following this top group, the Gnu Klassy and the Lib Tech T. Rice Orca both merited high scores. The Klassy grabs almost as well as the top boards, but we did feel it start to slip a little bit on some icy sections, dropping its performance down a point. The Orca is absolutely fantastic at cutting through chop and will hold an edge exceptionally well, even in icy conditions. However, there were one or two times where we took a corner a little too fast on steep icy terrain and felt the board began to slip out from under us. Next, the Jones Twin Sister, the Dream Catcher, the Mind Expander, the Arbor Swoon Rocker, and the Never Summer Insta/Gator all received above average marks. This group of snowboards all have solid edge hold in most conditions. However, we definitely notice some significant slippage when turning if there was an icy patch or uneven chop — enough to cause one or two crashes when we hit an unexpected patch of ice at high speeds. Rounding out the back of the group, the Salomon Pillow Talk all received a 6 out of 10. This board routinely slipped on ice or hardpack snow unless you were extremely diligent about making sure to carve and dig your edges in when turning. The Orca is our go-to choice for the deepest days. For our next metric, we moved on to assessing how well each board handled powder. To determine scores, we looked at the amount of float each board had, how it handled, and the effort required to turn, as well as just how much fun it was to ride in the deepest powder stashes. Altogether, these tests account for 20% of the final score for each board. While many of the boards are a total blast to ride in powder, one board stood out from the rest, earning a 10 out of 10 for its perfect performance. The Lib Tech T. Rice Orca is our absolute favorite when it comes to shredding the deep stuff, having the best float of the group by far. This directional board has a huge nose, giving it a super surfy feel that makes it tons of fun to ride. Following the Orca, a handful of boards tied for the runner-up position, with the Yes. Hel Yes., the Burton Family Tree Story Board, the Never Summer Aura, the Jones Twin Sister, the Salomon Pillow Talk, and the Jones Mind Expander all meriting high scores for their excellent performance. The Yes. Hel Yes, the Never Summer Aura, the Salomon Pillow Talk, and the Jones Mind Expander all have a directional, asymmetrical profile, while the Burton Story Board and the Jones Twin Sister have a symmetric twin tip profile, but have a set back stance, which gives them all tons of float. The Yes. Hel Yes, the Jones Twin Sister, the Mind Expander, and the Never Summer Aura all have great float, but get a little more bogged down in the deeper snow and require a little more effort than the Orca. The Salomon floats just about as well as the T. Rice Orca and is great for fast carving but doesn't grip as well, dropping it down a point. The Burton is tons of fun to ride in powder, but it doesn't quite have the float of the top boards. Next, the Gnu Ladies Choice, the Gnu Klassy, the Arbor Swoon Rocker, and the Jones Dream Catcher all earned excellent scores. Both of the Gnu boards have tons of camber and pop, so they can't match the float and lack the surfy feel of the big boards, though the Ladies Choice does have a tiny bit of an edge over the Klassy, due to its extra rocker between the bindings. The Ladies Choice has no problem with deep snow. The Arbor is decently fun in the powder, but its springiness makes it a bit more of a park board than a powder board. The Dream Catcher has tons of float, but it isn't as much fun to ride, being a bit slow edge to edge when going through the trees. Finishing out the back of the group, the Never Summer Insta Gator is much shorter and fatter than the best boards, so it is at an extreme disadvantage in this metric, but it did do surprisingly well regardless. The Ladies Choice provides superior stability at high speeds. Next, we ranked and scored each board on how comfortable we felt when riding it at maximum speed. To test this, we took each board down the steepest groomers we could find, noting if it developed any speed wobbles or other instabilities when on an edge or flat and how it handled any sections with chop or crud. Five boards tied for the top spot in this metric, with the Yes. Hel Yes., the Gnu Ladies Choice, the Burton Family Tree Story Board, the Never Summer Aura, and the Gnu Klassy; these boards are all tons of fun to go fast on and never showed any hint of a speed wobble. The Hel Yes is super stable at high speeds in all conditions. We also like that these boards handled varying snow conditions at higher speeds without any issues, slicing through chop without giving us any cause for concern regarding the stability of the board and we never felt like any of them would wash out from under us. These boards all delivered a predictable and consistent ride, even at maximum speeds. Next, the Jones Twin Sister, the Lib Tech T. Rice Orca, and the Never Summer Insta/Gator earned excellent scores for their solid stability at high speeds. The Twin Sister is on the stiffer side, so it rides with a damper feel that gives it a nice smooth ride. The Orca and the Insta/Gator aren't as stiff as the Twin Sister, but both are awesome at carving at high speed. They just aren't quite as consistent in choppy snow at higher speeds as some of the top boards when it comes to stability. Next, the Salomon Pillow Talk, the Jones Mind Expander, and the Dream Catcher; the Arbor gets really bouncy if the snow isn't perfectly even and we found it to chatter a bit when we hit top speeds. The Mind Expander has moderate to stiff flex but just fails to instill confidence when you are going at racing speeds. The Pillow Talk performs about the same, only showing some slight speed wobbles at the fastest speeds on the steepest slopes, mostly caused by its medium to softer flex. The Mind Expander has tons and tons of stability in deep snow, but its experimental profile can make it a bit funky on harder snow at faster speeds and it doesn't take too much to get it to start slipping. The Mind Expander is super stable in deep snow but isn't our top pick for harder snow at faster speeds. Finishing out the back of the group, the Arbor Swoon Rocker; this board is on the softer side and has tons of pop and playfulness, but isn't the best at higher speeds. The Twin Sister's rocker-camber-rocker profile makes it a playful board in all conditions. Next, we moved on to ranking and comparing how much fun it is to ride each board, which accounts for 20% of the overall score. We rode each board all over the mountain, awarding points for how well they spun, flexed, and maneuvered, as well as how enjoyable it was to ride each one. Tying for the top spot, a trio of boards stood out as being particularly fun, with the Yes. Hel Yes. and the Gnu Ladies Choice. The Yes. Hel Yes is really light and responsive, which makes it tons of fun to ride. It also is a blast to ride freestyle and switch. We loved the Hel Yes for its playful yet responsive ride. The Gnu Ladies Choice is such a great board that it is an incredible amount of fun to ride in all conditions. It's on the stiffer side but holds presses really well. It's super fast and is a great park board. The Ladies Choice is a fun board that is playful in all conditions. The Aura is really maneuverable, snappy, and responsive, while the Klassy has a medium flex and is also super responsive, but it has a distaste for rails and the park. The Aura is a responsive and maneuverable board for hard-charging, all mountain riding. The Twin Sister's rocker-camber-rocker gives it a very cruisy ride that is tons of fun and it an all-around solid park board. The Jones Dream Catcher has a much softer flex. It's a light and board that is tons of fun in the park and on natural features. It also is one of the easiest boards to press. The Burton Story Board and the Pillow Talk by Salomon each merited a 7 out of 10 for their level of fun. The Story Board is quite fun to carve with, but it is one of the stiffest snowboards of the review, so it can't match the responsiveness of the top boards in this metric. The Pillow Talk is really surfy with a medium flex, so it is tons of fun to ride in the trees but isn't particularly enjoyable on groomers. Rounding out the back of the group, we have the T. Rice Orca, the Never Summer Insta/Gator, and the Jones Mind Expander. The Orca is reasonably agile but it can't compare to the softer boards when it comes to playfulness and it much more suited for bombing down steep stuff. The Never Summer is a very similar board to the Orca, being almost identical to the Orca when it comes to playfulness. The Mind Expander is tons of fun in powder, but only so-so when it comes to playing around on groomers — it just can't match the lighter and more responsive boards when it comes to having a good time. Our last series of tests rated and compared just how much pop each board has, accounting for the remaining 15% of the final score. We took each board off jumps and kickers, looking at how willing they were to launch to determine scores. When it comes to becoming airborne, the Gnu Ladies Choice stood out, earning the highest possible score. This board has a ton of pop and wants to really launch when you ollie or jump. The Ladies Choice earned the highest possible score for pop. The Arbor Swoon Rocker and the Yes. Hel Yes. came next for their skills when it came to pop and jumping. These boards both come close to the Ladies Choice, but launch slightly less. The Gnu Klassy, the Aura, and the Jones Twin Sister all have a decent amount of pop, but none of them fly or ollie like the top boards. The Twin Sister has a decent amount of pop. The Story Board, the Dream Catcher, and the Pillow Talk followed. None of these boards seem like they have an innate desire to fly, but you can catch a decent amount of air if the lip is steep enough or ollie if you try hard enough. Finally, the Orca, the Insta/Gator, and the Mind Expander; the Orca and the Insta/Gator are both heavy boards without a lot of pop and seem like they prefer to remain firmly on the snow. You can get them airborne with tons of speed and effort, but don't expect to fly all that far. The Mind Expander is a little lighter, but still lacks pop and wants to remain just as grounded as the Orca and the Insta/Gator. Hopefully, this has given you a better idea of which board stands the best chance of being a true quiver-killer. While this might be an impossible task if you want a board that is perfect when it comes to ripping groomers, floating in deep powder, shredding the steeps, and playing in the park, but some of these boards come pretty darn close and we were incredibly surprised at how versatile some of the top boards are.